Historic instruments are usually finished with shellac which is often damaged or simply worn out on a lot of those instruments today. We are specialized in French polishing jobs, using shellac based on old, traditional formulas. 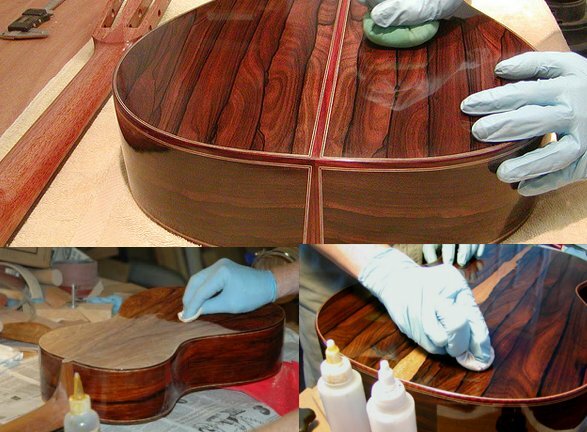 We can clean and repair shellac finishes, buff it or finish your new built instrument with shellac for maximum response. No other finishing system will give you such a stunning and almost three-dimensional effect which is especially breathtaking with highly figured woods. Our shellac ranges from crystal clear to black with all shades and colors in between like amber, gold, rubin-red, yellow, brown etc. Besides the traditional polishing job by hand, we can also offer shellac spraying jobs.